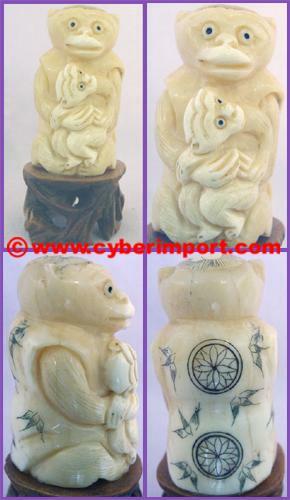 OUR ONLINE CATALOG and this monkey figurine page serve as a cross-section of our China exports. Greater variety is available. Email us a photo example of what you seek. Export prices often change. All are re confirmed after your inquiry. You will be emailed a pro-forma invoice offer. 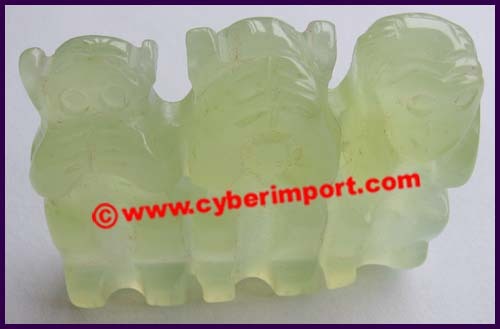 cvbn071 $7.13 10 - 1 7/16"x 1 7/16"x 2 7/8"
cvbn073 $2.74 10 - 1 1/2"x 1 1/2"x 3"
cvbn075 $5.49 10 - 4"x 1 3/16"x 2 3/4"
cvbn078 $6.40 10 - 1 5/8"x 1 5/8"x 2 3/4"
cvbn088 $7.32 10 - 4 1/2"x 1 3/4"x 2 7/8"
cvbn094 $3.66 10 81g 2 1/4"x 2 1/4"x 1 3/4"
cvbn103 $4.57 10 - 2 1/2"x 1 13/16"x 2 11/16"
cvbn138 $6.59 10 160 1 1/2"x1 1/2"x2 5/8"
Hand-made cloisonne set of three monkeys. 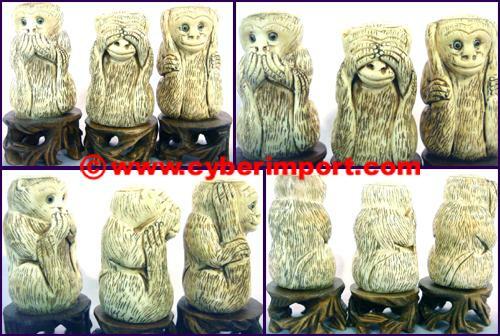 Hear No Evil, See No Evil, Speak No Evil. 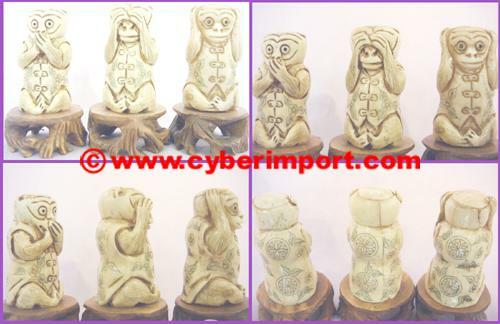 Each a separate piece and all sitting on a single wooden base. Floral designs on a brown background. They are delicately crafted with flat wire between enamel inlays. Made by the most skilled of craftsmen. 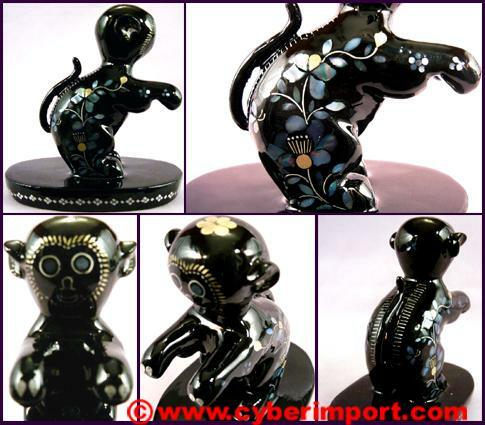 cvcl009-3 $17.99 10 - 1 7/8" x 1 1/2" x 1"
Hand-made cloisonne monkey. It is scratching the top of its head with the left rear paw. Floral designs on black body. Sits on a wood base. It is delicately crafted with flat wire between enamel inlays. Made by the most skilled of craftsmen. 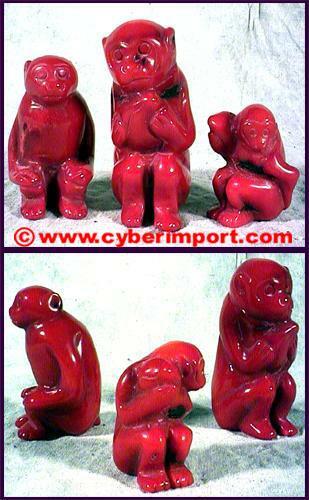 cvcl014-1 $9.99 10 - 1 3/4" x 2 1/8" x 1 5/8"
Hand-made cloisonne monkey. Floral designs on brown body. 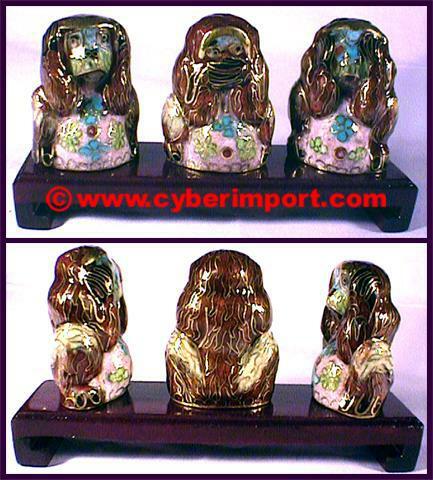 cvcl014-2 $9.99 10 - 1 3/4" x 2 1/8" x 1 5/8"
Hand-made cloisonne monkey. Baby is hitching a ride on Mama's back. Wire is inlaid to represent fur on brown body. Face and paws are contrasting browns and white. It is delicately crafted with flat wire between enamel inlays. Made by the most skilled of craftsmen. 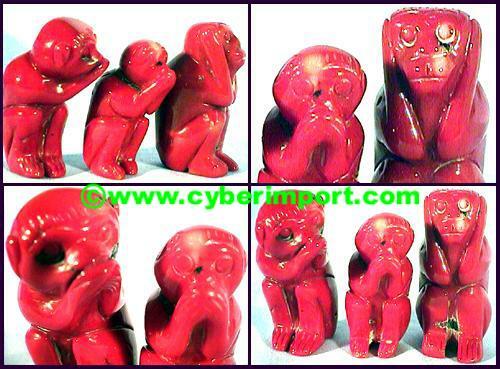 cvcl015-1 $9.99 10 - 1 1/2" x 1 3/4" x 7/8"
Hand-made cloisonne monkey. Baby is hitching a ride on Mama's back. 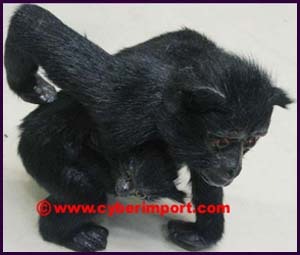 Wire is inlaid to represent fur on black body. cvcl015-2 $9.99 10 - 1 1/2" x 1 3/4" x 7/8"
cvcl015-3 $9.99 10 - 1 1/2" x 1 3/4" x 7/8"
cvco013-b $6.59 20 96 1 1/8" ~2"
cvco030-b $5.99 25 164 2 1/8" ~ 2"
This genuine, hand-carved coral features monkeys. 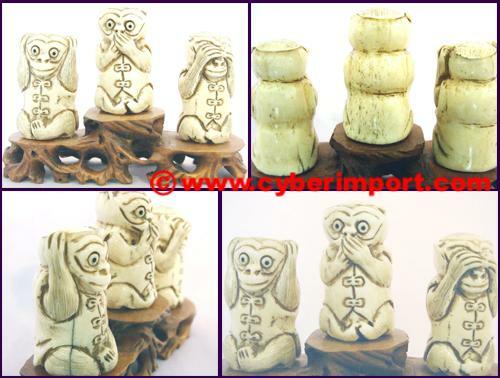 Set of 3, hear, see, speak no evil. Natural black inclusions of coral, something that the imitation resin does not have. 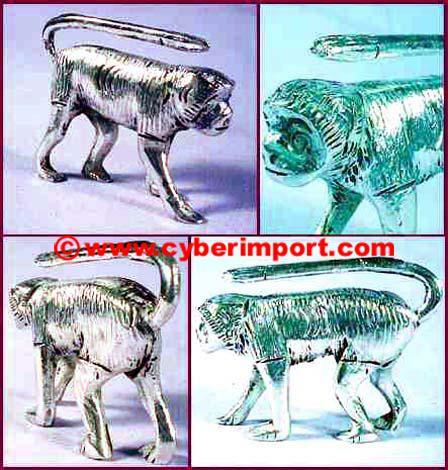 They add to character and authenticity of piece. 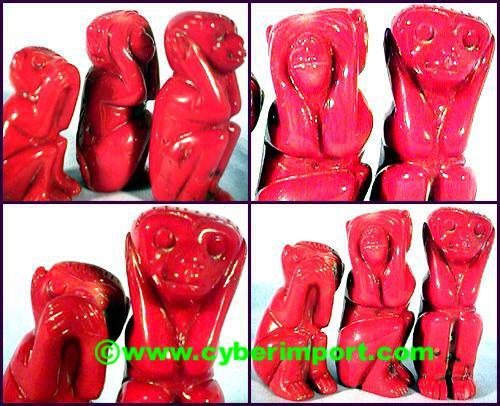 cvco031-b $5.99 25 134 2" ~ 2 1/4"
This genuine, hand-carved coral features monkeys. 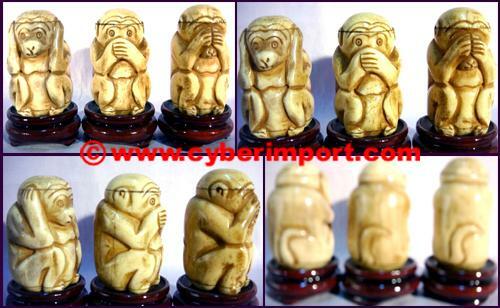 No evil theme. Three piece set. 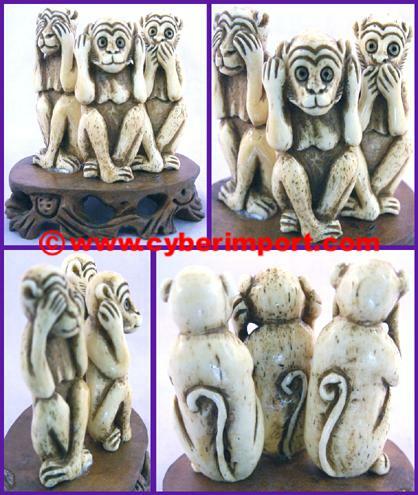 Two no speak, one no hear, and all three want to see the evil. 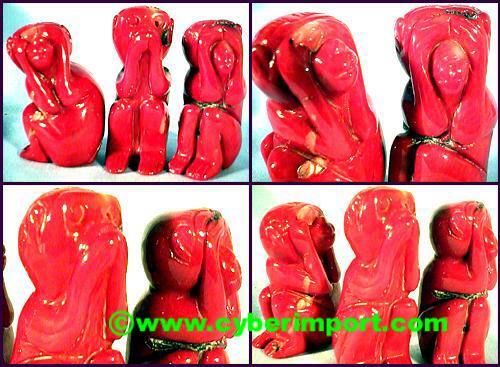 Natural black inclusions of coral, something that the imitation resin does not have. 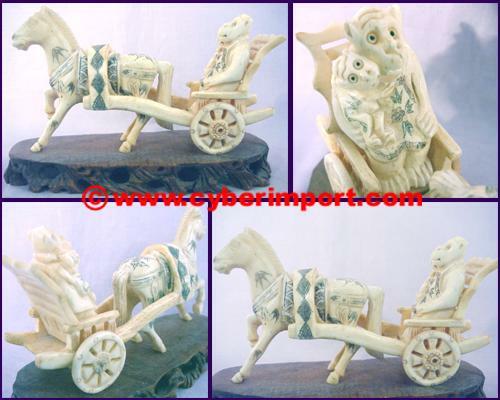 They add to character and authenticity of piece. cvco034-b $6.66 20 186 2 1/8"~2 1/2"
cvgd005 $1.81 50 18 2 3/16" x 2 3/16" x 2 11/16"
cvmp003 $9.15 25 42 3 3/8" x 2 1/4" x 3 3/4"
China Factory Minimum Quantity of these monkey figurine items can be negotiated with factories. Dollar Amount is often more important to smaller factories than the quantity of each piece. 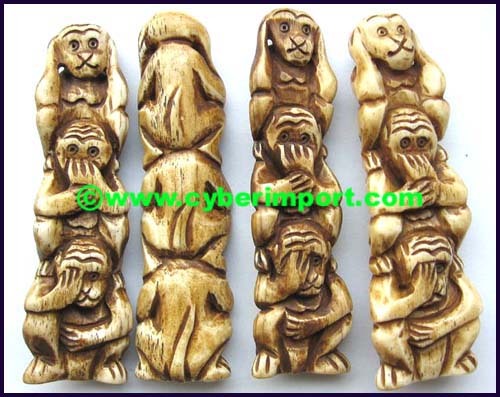 Minimum quantity often can be divided among several monkey figurine or stock numbers. Please inquire with us about your specific needs for smaller quantities than those listed. Smaller quantity can result in a bit higher price. Ask us for a quote. 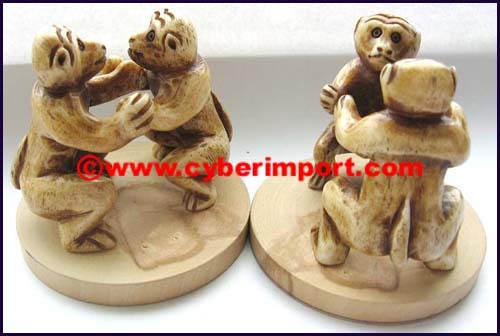 Custom Orders are possible with any of our monkey figurine products. Send us a .jpg example of what you want. If we don't have it, we can get it.